KeneTrek's fitted HUNTNG GAITER'S are designed to go over insulated pac boots, but they will wrap securely around any boot. The wide, full length Velcro closure opens with ease from the front and stays closed with the secure snap at the bottom. Made of tricot fleece with waterproof / breathable Storm Blocker memebrane to repel moisture yet allow sweat vapor to escape. You won't believe how quiet these gaiters are! Imported. RealTree AP, Black, Snow Camo . 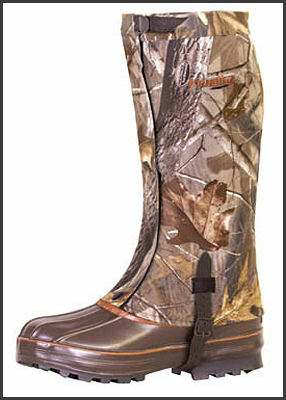 Men's boot sizes M(5-8), L(9-12), XL(13-15).